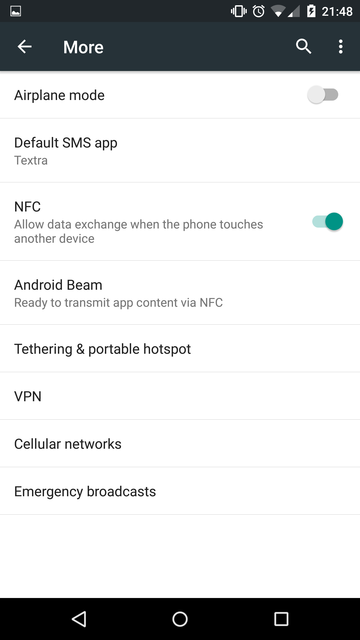 In my last post in this short series, I want to discuss how to setup a transparent proxy on your Android phone using the builtin VPN for L2TP. As usual, the same precautions apply here. Don't be stupid with your data, just because you can hide it from your ISP. In general, I'm skeptical of VPN service providers, which is partially why I'm writing this post. There isn't a VPN provider on this planet that will go to jail for you. And I don't buy into the hype that they aren't logging your traffic. Too often, VPN providers have been all too hasty to turn over user account information and logs, when Big Brother comes knocking. Instead, install strongSwan on your own L2TP VPN server, in a datacenter you trust to handle your traffic, and configure your Android to use that. 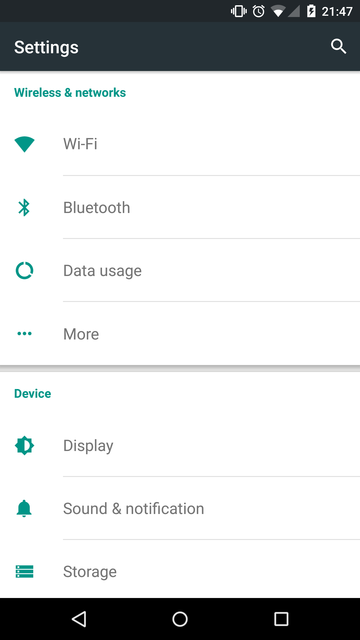 Tap the "+" sign to add a new VPN configuration. 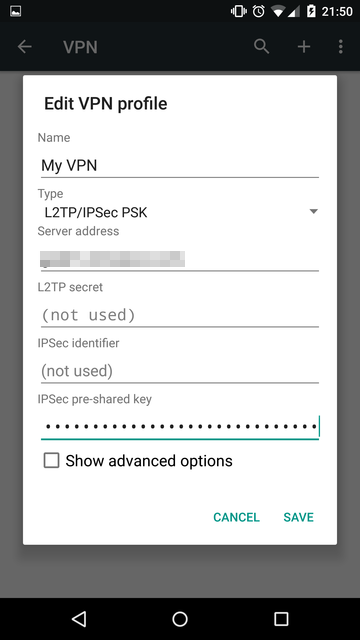 In this example, we'll configure it to connect to an L2TP/IPSec PSK VPN. As such, you'll need to fill out the server address (pixelated here), and the IPSec pre-shared key. 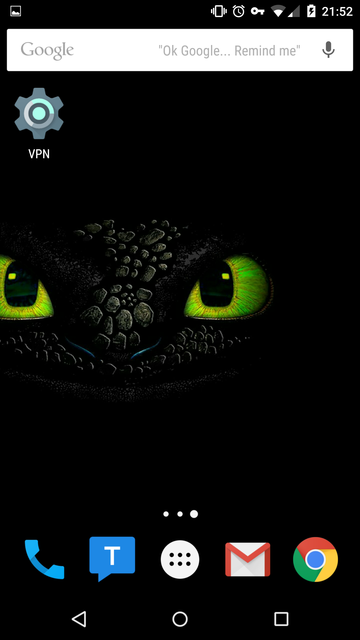 Give the configuration a name, such as "My VPN", and tap "SAVE". When tapping on the "My VPN" defined configuration, you will be asked to authenticate with your credentials. These can be from the operating system accounting database, LDAP, NIS, or IPSec specific. Provide your username and password, and tap "Save account information" if you want to save the credentials to disk on the phone. Then tap "CONNECT". 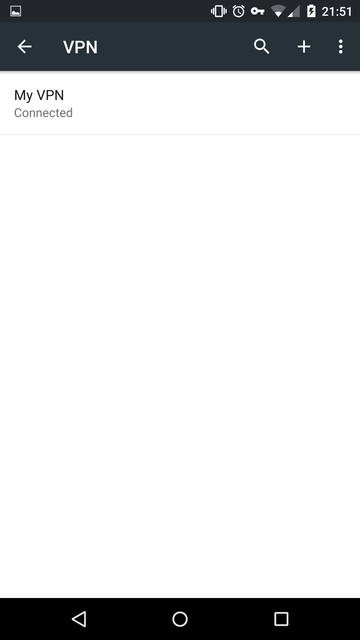 At this point, you should see a little key in the status bar, confirming that you are indeed connected to the VPN server. 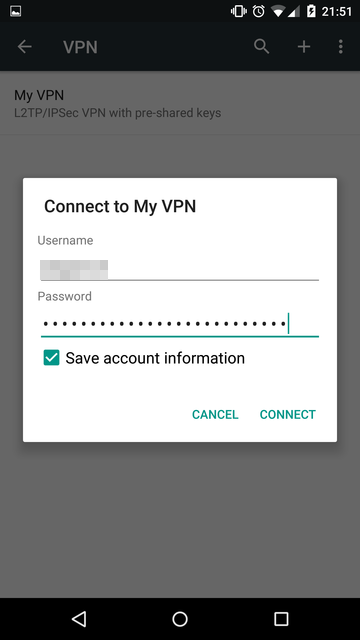 If you want, you can create a "VPN" quick-access widget on your home screen, so you can get immediate access to your "My VPN" configuration with a single tap. Posted by Aaron Toponce on Friday, September 4, 2015, at 6:00 am. Filed under Security. Follow any responses to this post with its comments RSS feed. 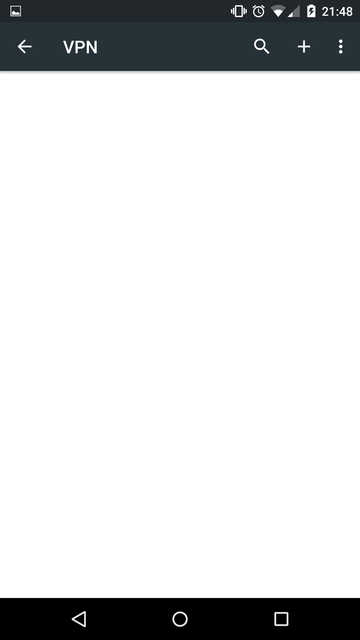 You can post a comment or trackback from your blog. For IM, Email or Microblogs, here is the Shortlink. Well... that was easy! Lol. Thanks for the guide!